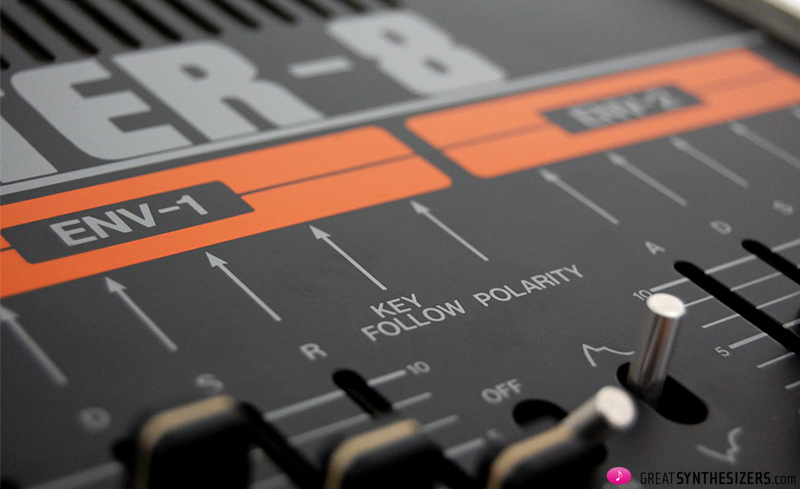 Roland Jupiter-8 Synthesizer: The name alone is magic to many musicians’ ears. And as much a desired object today as in 1981. Next to the Sequential Prophet-5, this synthesizer represents one of the milestones in the history of polyphonic analog synthesizers. Listening to the Jupiter-8 these days may impress you, while at the same time you could deem it a tick less spectacular than others of its famous contemporaries. 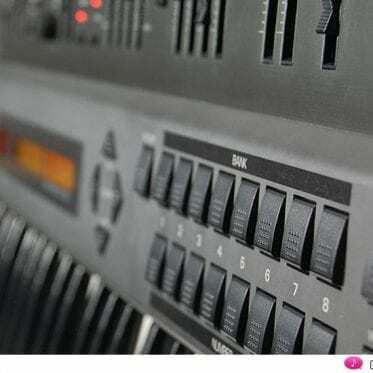 Whether it’s the Moog Memorymoog, Sequential Prophet-5, Rhodes Chroma, Yamaha CS-50/60/80 or Oberheim OB-X/Xa/8: They all sound a little more alive and – depending on one’s own judgement – a little more “analog” than the Jupiter-8, possibly because of their lively, while slightly unstable, tuning, their special filter design, or their myriad modulation routings. There are many reasons why musicians could find them more exciting than the Jupiter. Allowing for the fact that the story of this 8-voice flagship could fill whole books, let’s concentrate on 5 of its most remarkable aspects. Looking back: After its founding in 1972, Roland fought against financial uncertainty for years. The company was too small and too little-known to convince Japanese banks to grant them the sizeable credits necessary to finance electronic components. So, how to get the company off the ground? Roland-founder Ikutaro Kakehashi did get his credits, in due, but from his suppliers, not from his banks. And they granted him time, rather than money. 90 days, to be exact, in which to transform those components into instruments, to get those instruments out onto the market, and to sell them. 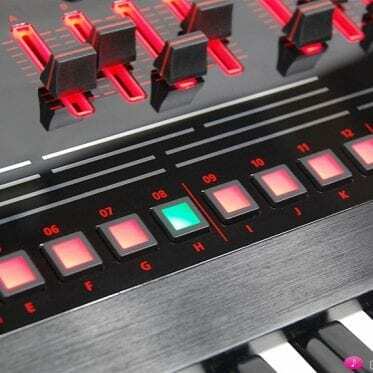 With the Jupiter-8, Roland entered a long-term phase of financial security. Although this new Japanese synth was staggeringly expensive (980.000 YPN, 4000 GBP in 1981), it was also staggeringly good. As such, it was soon an object of desire for pro-musicians all over the world. 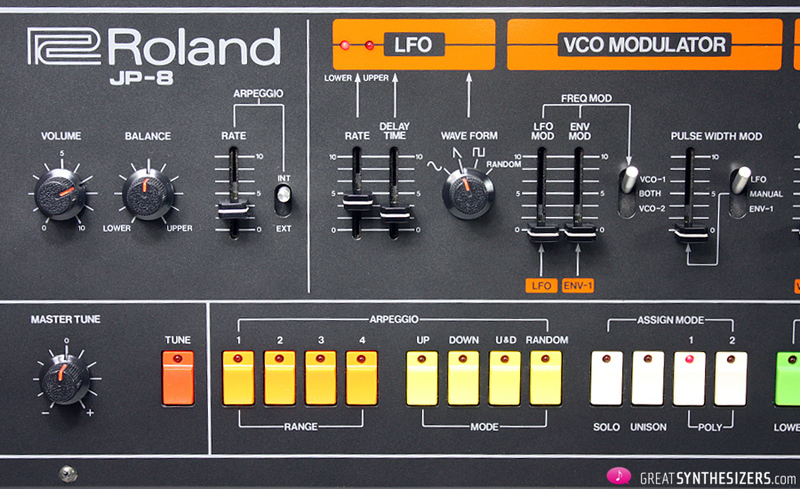 [* Although, for a split second, Roland was nearly forced into bankrupcy in 1980. The official foreign exchange rate (Yen – European currencies) shifted dramatically, drastically increasing the prices for Japanese imports to Europe and forcing Brodr Jorgensen (Copenhagen), European Roland distributor, out of business. 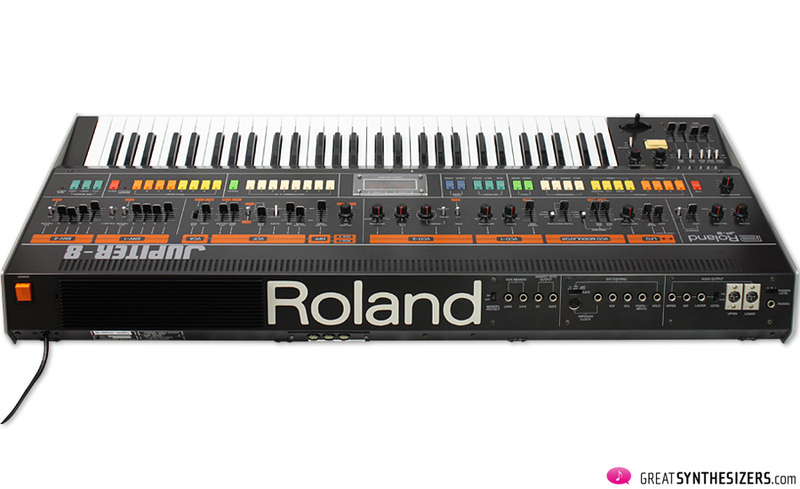 As an ambitious company, the Roland of the 70s and 80s was determined to give its customers only the best. In relation to instruments, this meant satisfying a target group and its special financial possibilities. SH-1, SH-2 and SH-3 were produced with students (and their budgets) in mind, whereas Jupiter-4 and Jupiter-8 were meant for the more elite market of established musicians looking for “solo voice orchestration” (key word: polyphony). 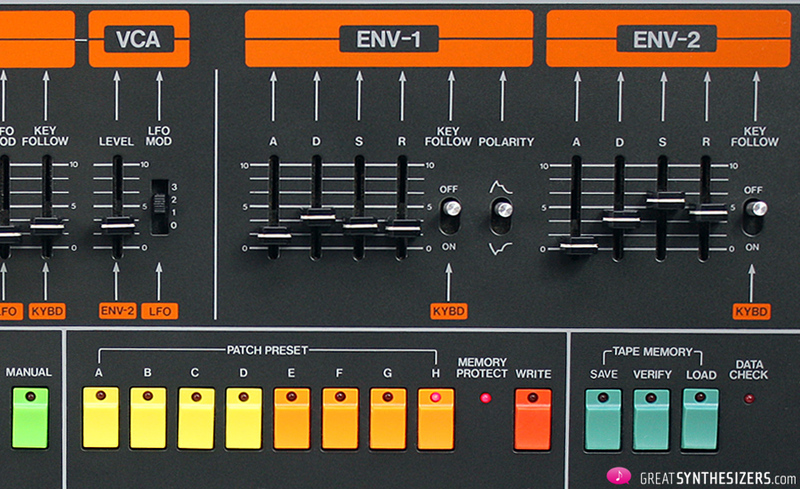 Be that as it may – take any Roland synthesizer from way back then and give it a good look. Its high construction quality is still evident. 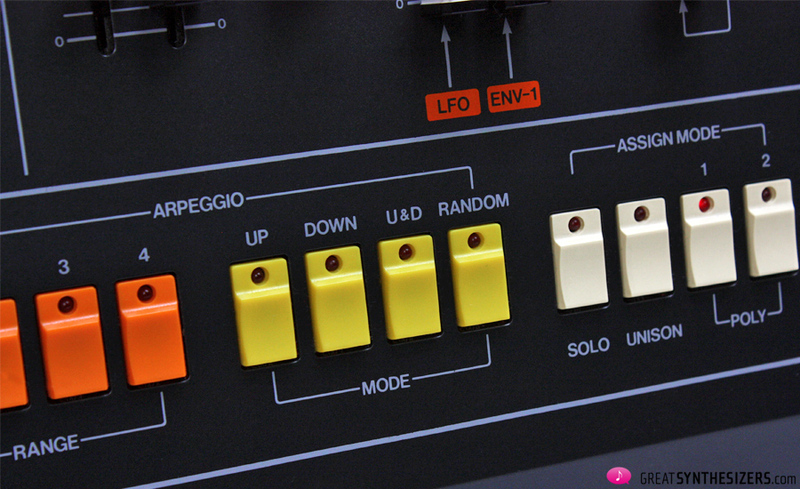 Even today, the Jupiter-8 ranges technically among the top synths of all times. 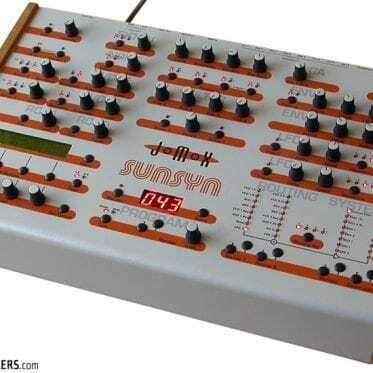 It’s the most reliable polyphonic analog (pro) synthesizer of the synth-pop era. A piece of technical mastery. 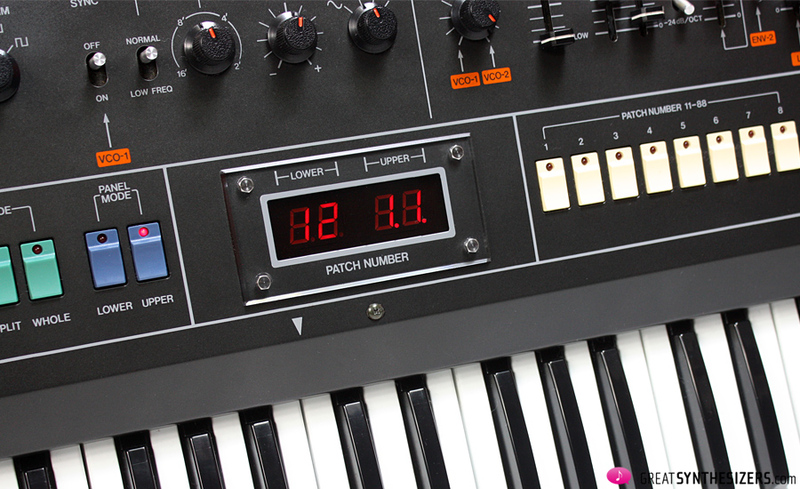 Short and to the point: The Jupiter-8 stands for the most elegant synth design ever. This is my humble opinion, of course, but … Roland’s flagship is still without a doubt the best-designed polyphonic (analog) synthesizer around. A well-maintained Jupiter-8 is just as breathlessly beautiful today as it was in 1981. I‘ve been wondering for years why the Jupiter-8 is so coveted the world around. Ok, ok, of course it sounds good, but … isn’t the vivacious Memorymoog much more inspiring? 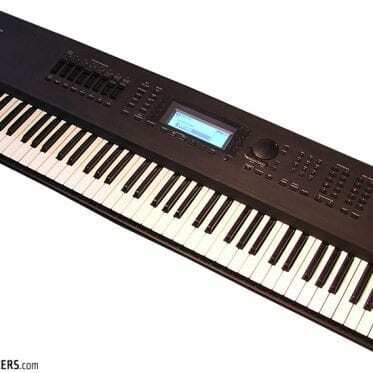 And what about the Rhodes Chroma with its endless modulation possibilities? And the stunning Oberheim OB-8 with its lovely stereo voice-panning? Futuristic: Not only precise and reliable, but with a revolutionary slim line. 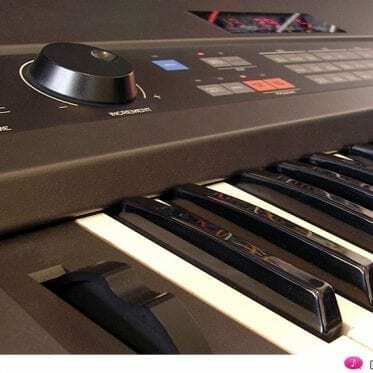 Characteristics that also distinguish a Yamaha DX7 (although we’re far from wanting to make a comparison between the Jupiter-8 and DX7). The Jupiter-8 sound generally gets by without those irritating voices drifting out-of-tune, a sound that is reliable, a sound that enables 8-voiced-chords (and those harmonically exact and precise), finally, a sound that can be re-tuned in a split second (14-bit models of the Jupiter-8), all in all: The sound-ideal of a professional instrument (and of a whole generation). In addition to these musical aspects, the Jupiter-8 also boasts a digital hardware speciality: Roland released the DCB (Digital Communication Bus) in 1981 – a fore-runner of MIDI, if you want – and then released the Jupiter-8 and Juno-60 with DCB in 1982, alongside with the JSQ-60 DCB-sequencer. So, starting with Ser. No. 282880, the Jupiter-8 was equipped with that DCB port. But in order to connect it to MIDI, you still needed the Roland MD-8 (MIDI-DCB) interface. True, the Jupiter-8 is about more than just synth-pop. 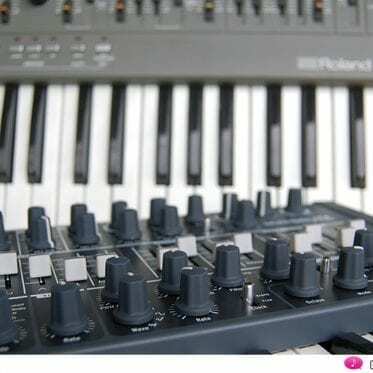 It was by no means just an instrument for that new genre that featured the synthesizer as dominating instrument, but also a major factor in film music, a major factor, actually, in professional music applications all around the globe. “Synth-pop reached its commercial peak in the UK in the winter of 1981–2, with bands such as Orchestral Manoeuvres in the Dark, Japan, Ultravox, Soft Cell, Depeche Mode and even Kraftwerk, enjoying top ten hits. “When the Roland Jupiter-8 first came out, it was the most desired instrument on earth – so, needless to say, you couldn’t get it. There was a waiting list for it. We had a very good relationship with Roland, though, due to the fact that I worked with Jeff Baxter from the Doobie Brothers. He was under contract with them, so he had access to the instruments. He put in a word, you know, so I definitely got a deal. The noble Jupiter-8 filter must be emphasized. At high resonance settings, its sound character becomes graceful and charming (… whereby this all may not be obvious at first). But the special combination of a warm sound basis and those powerful filter-sweeps is certainly a major characteristic of Jupiter-8 magic. Although the modulation possibilities of the Jupiter-8 are modest – to say the least (just a single LFO, cross modulation and noise … and that’s it) – the instrument’s range of sounds can be increased by utilizing its exemplary array of control voltage inputs. In the attached soundfiles “Ext LFO (1)” and “Ext LFO (2)” we used an external (wide frequency) LFO for filter modulation. Another important fact: The Jupiter-8 blends well without getting lost in (and without dominating) a mix. Unlike the Moog Memorymoog, for example. 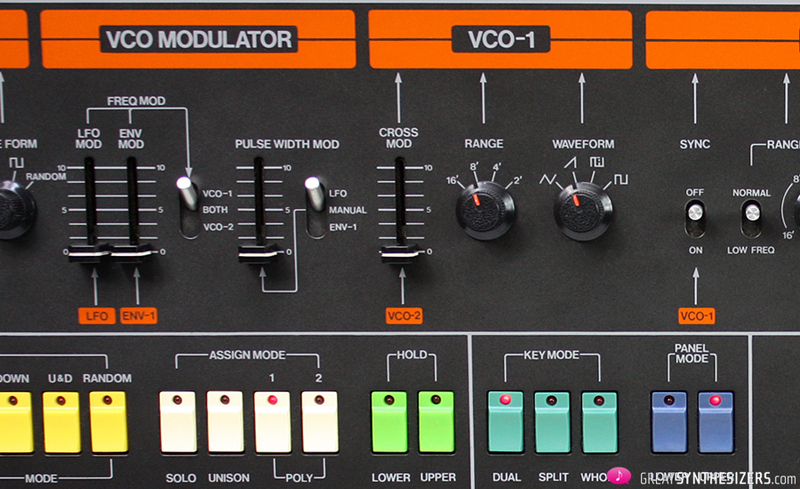 That synth is an excellent solo-synthesizer, but might adversely affect your mix, as Memorymoog users attest. Nothing against the Jupiter-8 and its high-end analog sound. But that high-end analog sound may get it into a bind. Many modern (virtual analog) instruments are acoustically similar. 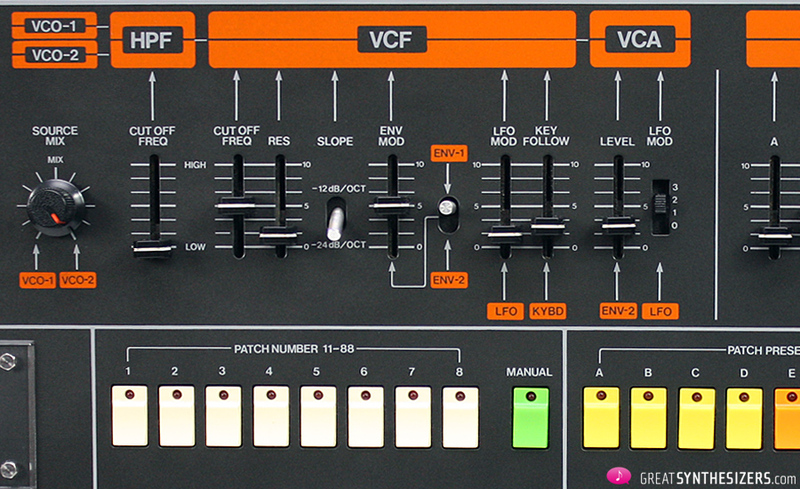 An Access Virus, for example, is an ideal instrument for soft pads, something that a Jupiter-8 can do, too. So, since the Jupiter-8 rarely goes out-of tune, and since it boosts such a brilliant, stable analog sound, it may be difficult to distinguish its sound from modern (virtual analog) synths. Of course we’re talking about bread-and-butter sounds. A soft sawtooth-pad, for example. When it comes to screamy, vivid sync-lead-lines, no virtual-analog competitor can hold a candle to the Jupiter-8 – we have to admit. Whether or not the new desktop JP-08 boutique synthesizer is a real substitute, remains to be seen. The toothpick-sized faders are a strong indication of the current Toys’R’Us-synthesizer-culture. So, using such an instrument (if you want to call it that) in a studio is – at least to us – No-Go. 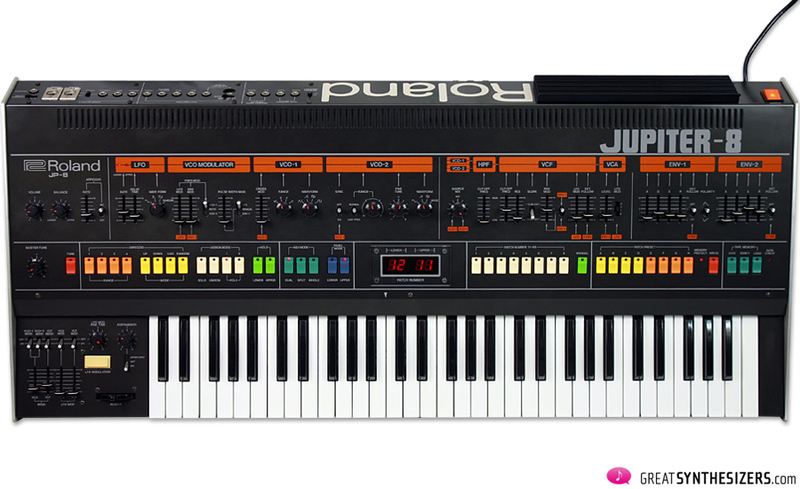 Those of you on the look out for affordable vintage Roland sounds, reminiscent of the Jupiter-8, should keep a lookout for a Roland Juno-60. 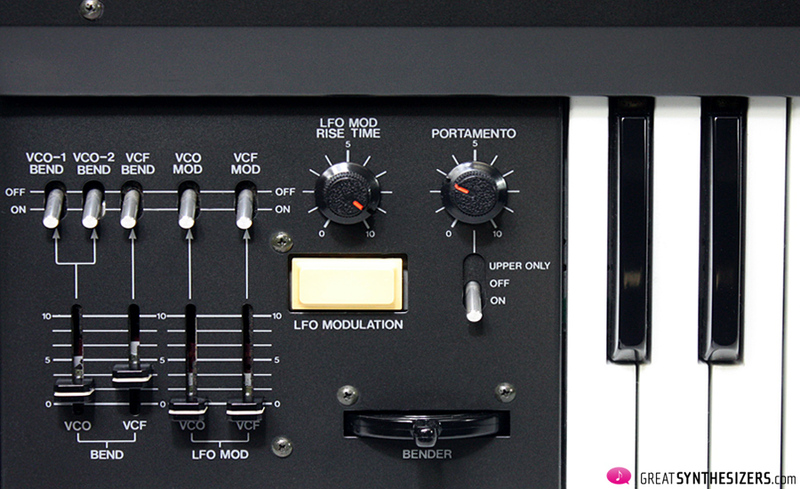 Thanks to its integrated stereo-chorus and sub-oscillator, the Juno sounds full and warm, similar to the Jupiter-8. In terms of arpeggio- and sequencer-pattern-sounds, standard lead-lines, warm organ-sounds and soft strings, the Juno-60 delivers just about everything we associate with that classical Vintage Roland Sound. Nevertheless, the Jupiter-8 – the grand master of synth-pop – is still one of the brightest stars in synthesizer heaven. 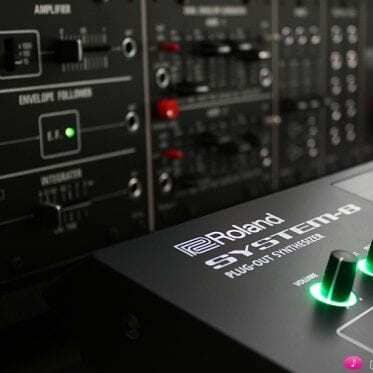 Several aspects characterize it as a flagship synth: The extremely high craftsmanship (resulting in top reliability), its well-balanced and timeless design, its powerful (if somewhat steril) analog sound. So it remains up to you to decide whether you place your priorities with the powerful, yet clean and stable Jupiter-8 sounds, or not. The unique selling point of 1981 (that highly reliable sound) is not necessarily a top goal these days. Quite to the contrary: It’s those synths with their one or other weaknesses (poor tuning stability, etc.) and strong sound charcteristics (special filter design, etc. ), that might be seen as the cream of the crop in terms of exciting vintage analog sound today. All considerations aside: The Jupiter-8 remains one of the great classic synthesizers of all time. Its sounds are warm, powerful and massive. And it’s still an eye-catcher. Appendix: Approx. 3300 Jupiter-8 were made. Production run startet in February 1981 (Ser. No. 030100) and continued until end of 1984. 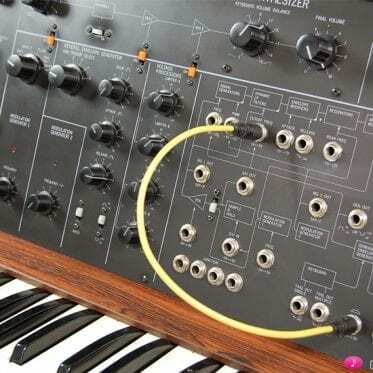 The highest Jupiter-8 serial number we found on the web is Ser. No 453338 (date of production: August 1984). We have attached 25 minutes of audio material in which you hear the Roland Jupiter-8 exclusively. 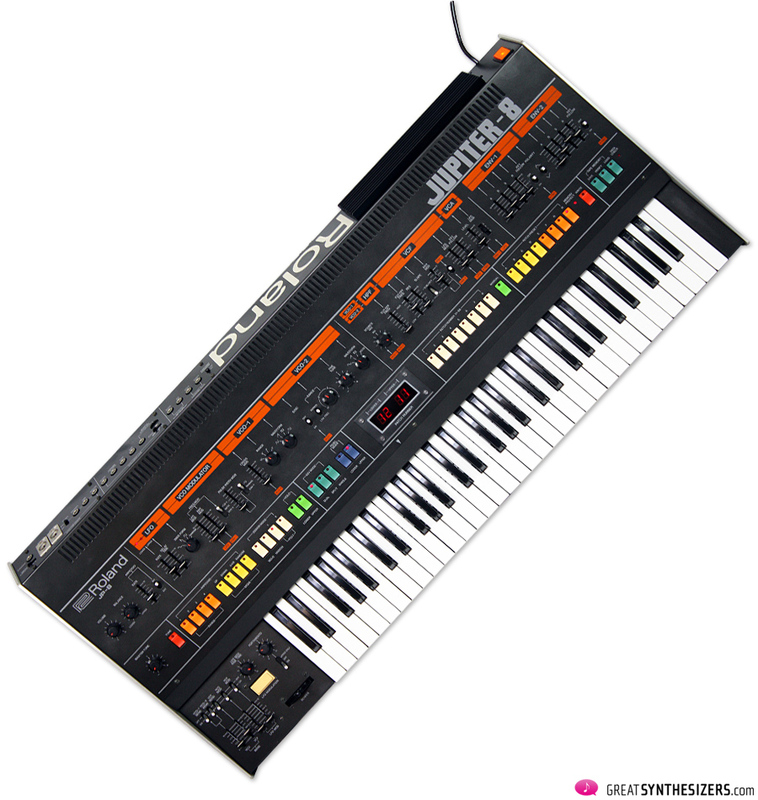 With the exception of the soundfile “The Roland Family” (by Luis Debon), which is a mix of the Roland Jupiter-4, Jupiter-6, Jupiter-8, JD-800, VP-330, SH-101 and CR-78. … hi Michael … I don’t remember that we used external effects for the demos. Guess it’s all plain Jupiter-8. 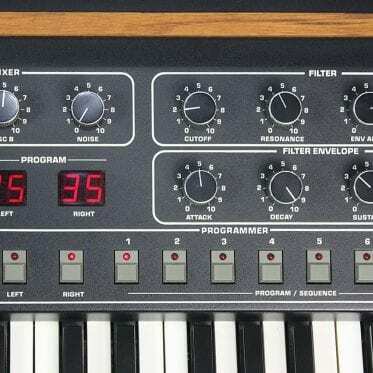 YES – the Prophet-5 has a much heavier, thicker sound. That’s at least my opinion. 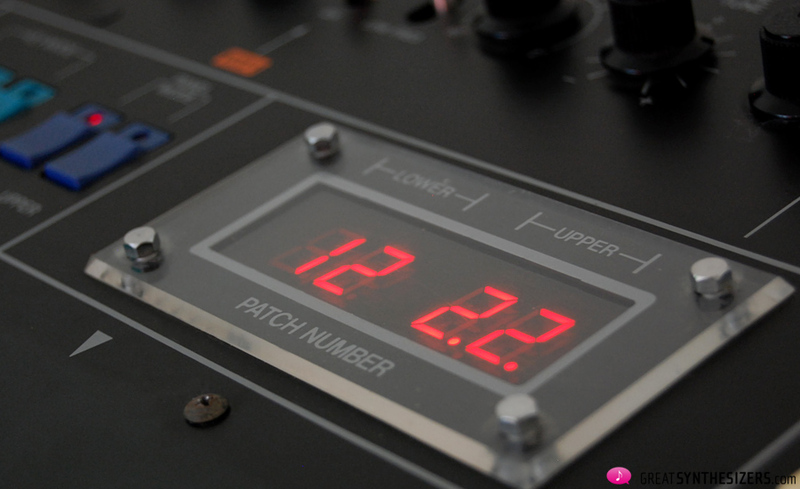 It’s the most “analog” sounding polyphonic vintage synth – besides Memorymoog, Chroma and CS-80.